Rice bran oil has me singing these days. If you cook, you probably use some kind of oil in frying, sautéing and baking. But what’s the right oil to use? How about rice bran oil? It’s not just for stir frying your favorite Asian dish anymore. Oh no, it has stepped into the spot light and is enjoying its close up. Many researchers and health care professionals say rice bran oil is one of the “healthiest edible oils” in the world – and the world is a big place. They may just be right. Rice bran oil contains vitamins, minerals, amino acids, essential fatty acids and antioxidant nutrients that help to: promote good health, fight free radicals, combat the effects of aging, improve serum cholesterol levels, prevent cardiovascular diseases and enhance the immune system. The Gamma Oryzanol in it helps to reduce the absorption of cholesterol from the foods that we eat; and Omega-6 fatty acids it contains help to decrease your appetite and help you feel full. What about taste? It is delicate and extremely light. It’s perfect for frying, sautéing, baking, and salad dressings. In fact last week when I made honey corn bread, I replaced my usually canola oil with rice bran oil and it baked up golden brown, with a lighter texture and delicate favor. I’ve also used it in deep frying chicken, pan frying fish, making yam chips and of course in stir frying vegetables – which is it absolutely perfect for because it has a very high smoke (burn) point. Hands down ,it is the most versatile oil I have every used. Rice bran oil is not widely available yet. Most health food and specialty food stores like Sprouts in Los Angeles have it. There I bought the one featured in this post. It’s from California Rice Oil Company. The 25 ounce plastic bottle was about $7.95.And as always you can get it on Amazon.com. So, should you throw caution to the wind and fry up everything in site? I am afraid not, all things in moderation dear heart. But when you are being immoderate, hitch your wagon to rice bran oil. It burns – in the kitchen that is. 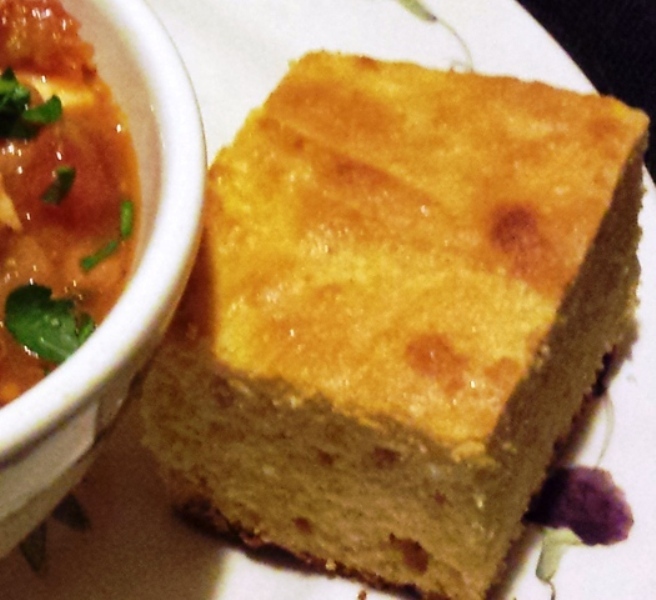 This entry was posted in Foodies and tagged bran, corn bread, food, oil, rice. Bookmark the permalink. I love that you love California Rice Oil-great write up! !